I had an urge for coffee and blogging at the same time ….so I made my way to the nearest coffee place and had my usual Latte. I found that blogging in a cafe helped me unwind, relax, and let the words simply flow onto the computer screen. If you are like most people, or rather, like me….you will look at what happens to you in life in a negative way. You focus on the challenges instead of the positive. You might hesitate to take any action because of the possibility that you will not succeed. I admit I am a worrier, a pessimist sometimes…mostly because I let my fears of the unknown get to me. I become frustrated and even think of giving up on things…..but….somehow or rather, just when I feel like all is lost, a ray of light comes trough to pull me out of that spiral of negativity. It's almost always a loved one..a friend..a stranger (sometimes without them even knowing my problem)…or even a quote/philosophy of life that instills that positive grain in me to make a stand to accept my challenges at hand. Yes I am blogging this because I have been faced with a problem, a challenge, a situation that has created chaos in my mind…ultimately affecting my health even. Today I made that decision that this has to stop…I am going to face this challenge and stand up for my rights. Who or what inspired me with that positive grain this time?…it was a famous quote by Winston Churchill that played over and over like a broken record in my mind. Though the problem at hand is not literally related….but it has some relevance to it. With his quote above, he reveals something that so many people try to avoid, especially women. You may ask why is this so? In trying to keep the peace and to avoid confrontation, we allow ourselves to vanish and become anything, depending on whoever we are with. While it is true, we have to however pick our battles and stand up for those ideals and rights that we find essential to have a better way of life. Upon making the decision to stand up for what we believe in, we must realize that we may lose some relationships. No matter what the situation, no matter how many times you are shoved aside, never allow cynicism to detour you, always believe that things can improve if you have the courage. "One has to love thyself first. 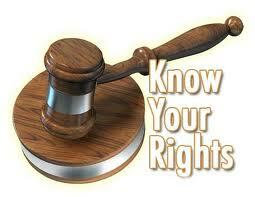 Do what you have to do to ensure your rights are protected." I would also advise continual education and updating on what it is that you believe in, and even more importantly, to research the other side no matter how deeply you disagree with it. By understanding the opposing argument, you may be able to create an even sounder argument for your position….and perhaps even discover something we had not realized that changes your opinion of the other side for better or for worse. The key is to always seek knowledge and to keep an open mind. This way, you can stand firmly behind what you believe in with a clear and sound mind with valid reasons. It is important though to remember that life doesn’t give you bravery or fear, you are the one who chooses between the two. Life gives you opportunities and it is up to you to use these opportunities to your advantage. Know that each one of us has courage and fear inside of us, it is up to us to choose which one. Which one are you going to choose? Despite all the challenges that you might have encountered, you have to be brave. With a small shift of your attitude, you can turn fear into bravery and optimism that you can use for your own advantage. Be optimistic as much as you can and know that fear is what makes you focus on the negative side of things instead of the positive. No matter how small the steps you take, they are still a sign of bravery and courage. Do you feel shy, for example, to give a speech in front of others? Start taking small steps until you become more brave to stand and talk in front of many people. Bravery is like any other skill, it needs to be practiced, so it becomes second nature. What you consider an act of bravery, others might consider it as normal. Know that each one has different capacities, so you have to know yours. You have two choices, you either become brave to challenge fear and the obstacles in your life or stay in your comfort zone and achieve nothing. Remember if you decide to become brave, you are on the way to prosperity, progress, and creativity. 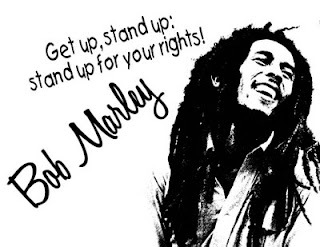 Finally here is something to boost the motivation.…a video of Bob Marley's Song, Get Up Stand Up.